In the fair city of Detroit, nestled among the garage-rock nooks and country crannies, lurks the music of Blanche. Husband and wife Dan and Tracee Miller trade intense and haunting vocals over an uneasy sea of pedal steel, banjo, raw guitar sounds, and sparse, driving drumming. The moods created in the songs seem to define Blanche. Some songs are sad and pretty, while others have a powerful, spooky feel. The melodies trick you into singing along with tales of superstitions, garbage picking, fading trust, and feelings of lost hope. The sound combines the intense desperation of the Gun Club, the sincere sadness of the Carter Family, and the creepy playfulness of Lee Hazlewood. 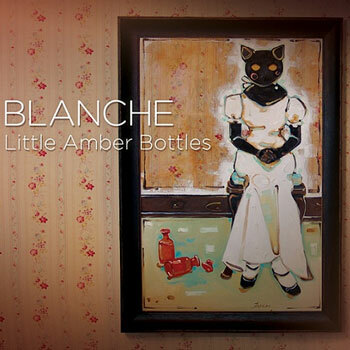 Blanche has come together from the well-preserved ashes of singer-guitarist Dan John Miller’s previous two bands. The seminal country-punk band Goober & the Peas released two acclaimed albums while touring incessantly throughout the U.S. and Europe, with artists such as Morphine and Uncle Tupelo. Next, Miller shed the ‘Goober’ moniker and teamed with Jack White (now of the White Stripes) for the country-garage collaboration, Two Star Tabernacle. Along with Tracee Miller on bass and Detroit Cobras’ drummer Damian Lang, the band made only one official recording, a 7 inch for Bloodshot Records, on which they joined forces with R&B/garage legend Andre Williams. In Blanche, the band resembles a dolled-up meeting of the Stepford Wives and a Lawrence Welk gospel special. Live, the band kind of lulls the audience into their dark, awkward world, and gradually builds intensity toward a frenetic finish. Among others, the band has played with 16 Horsepower, the Handsome Family, the White Stripes, Wilco, Loretta Lynn and Calexico. The band’s debut release, a 7-inch on Cass Records (US) and Loose Music (Europe), is “Who’s to Say…” b/w “Superstition,” released in the fall of 2003. After a tour of the UK in November of 2003, Blanche’s debut album, “If We Can’t Trust the Doctors…,” produced by Warn Defever, David Feeny and Brendan Benson, will be released in January of 2004. To create, maintain and extend throughout the community high standards of musical standards.